The name "Channeled Scablands" was first used in the early 1920's by geologist J Harlen Bretz of the University of Chicago, who made a comprehensive study of the region and proposed the idea that the erosional features were the result of a gigantic flood. Although Bretz' concept sparked a lively controversy, most geologists today agree that the Scablands were carved by a flood of unprecedented proportions that took place 18,000 to 20,000 years ago during the Great Ice Age. The Spokane Flood left its mark along a course of more than 550 miles, extending from western Montana to the Pacific Ocean, but the most spectacular flood features were carved into the black volcanic rock terrain in eastern Washington. This rock, the "floor" of the Scablands, is basalta dense crystalline lava that covers more than 100,000 square miles in parts of Washington, Oregon, and Idaho. The part of the lava field that underlies the Scablands in eastern Washington is a saucer-shaped area of about 15,000 square miles almost completely surrounded by mountains and nearly encircled by three riversthe Columbia, the Spokane, and the Snake (Fig. 2, page 3). Fig. 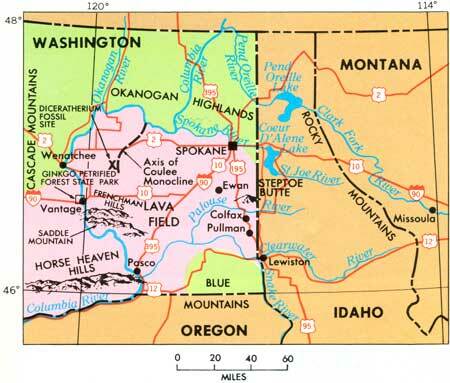 2. Geographic setting of the Channeled Scablands, eastern Washington. Fig. 3.Vertical dikes of basalt cutting lava flows. These are the fissures now filled with solidified material that once served as conduits through which molten rock reached the surface. Fig. 4.Canyon cut into layers of basalt (each layer represents a separate flow). Fig. 5.Steptoe Butte. An island of older rock standing above the sea of basalt that surrounds it. In this area the basalt is covered by a "frosting" of loess. Most of the lava erupted during the Miocene Epoch of the Tertiary Periodbetween 30 million and 10 million years ago. At times, one flow followed another at short intervals, but at other times, tens of thousands of years intervened between flows. Erupting from long wide fissures, the molten rock flowed onto a hilly terrain of older rocksan area that probably looked much like the present-day country north of the lava field. The molten material crystallized in the fissures to form dikes. In places, erosion has exposed swarms of dikes that cut older rocks. These places are believed to be major sources of the lava. Early flows filled the valleys and subsequent flows covered most of the high hills as layer upon layer of lava eventually formed a solid sea of basalt, in places more than 10,000 feet thick. Several individual flows, with thickness of more than 75 feet, have been traced for more than 100 miles. Around the edges of the lava field a few hills poke up, island-like, through the basalt. One of the most prominent of these, Steptoe Butte, near Colfax, Washington, has given its name to all such features. Geologists call any island of older rock surrounded by lava a steptoe. Molten lava occupies a greater volume than solidified lava. As fresh lava slowly cools and crystallizes, a hexagonal pattern of shrinkage joints commonly develops at right angles to the cooling surface. These joints break up the lava into vertical columns of rock. Many of the basalt flows in eastern Washington display this feature called columnar jointing. Fig. 6.Columnar Basalt. 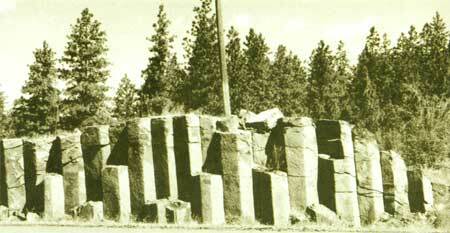 Large regular columns exposed in a road cut near Spokane, Washington. Fig. 7.Artist's concept of Diceratherium. Where basalt encroached upon a pond or lake, the quickly-quenched lava formed rounded blobs called "pillows" instead of columnar joints. In the western part of the lava field, a flow of basalt engulfed a swamp forest but, because of the water, the molten rock formed pillows and did not completely consume the plants. Among the fossilized remains of these plants are logs of the famous Ginkgo tree, a species that has survived for 250 million years. In 1934 an area of about 6,000 acres near the town of Vantage, Washington, where the vestiges of this ancient swamp are exposed, was set aside as the Ginkgo Petrified Forest State Park (Fig. 2, page 3). At a different time, but less than 50 miles northeast of the site of the swamp forest, another advancing lava flow encountered a shallow pond containing the floating body of a dead rhinoceros. Again, water prevented the molten rock from completely consuming the flesh; instead, pillows of lava enclosed the body forming a crude mold. 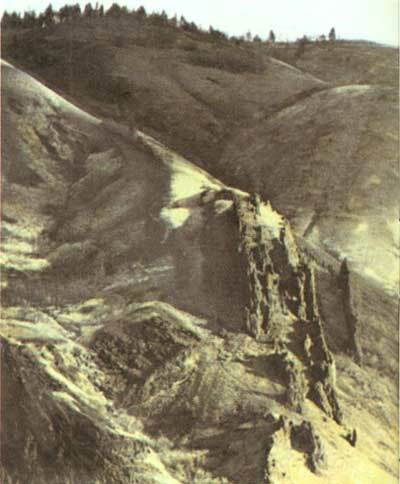 In 1935, the site of the incident was discovered in the form of a cavity in a basalt cliff (Fig. 2, page 3). The cavity contained several teeth and numerous pieces of fossilized bone. Studies of the shape of the cavity and the fossil remains showed the rhino to be one of an extinct species of Diceratherium. After the eruptions ended, the lava field was tilted as a unit to the southwest. 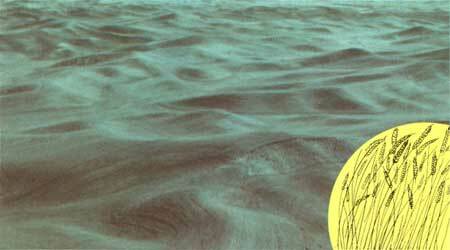 Today the northeast rim of the saucer-like field is about 2,500 feet above sea level whereas its lowest point, near Pasco, Washington, is less than 400 feet above sea level. In addition to regional tilting, the lava field was deformed in places to yield a series of fold ridges. Saddle Mountain, Frenchman Hills, and Horse Heaven Hills are examples. Several of these can be seen along the west side of the lava field between Wenatchee and Pasco (Fig. 2, page 3). Of particular interest is the Coulee Monocline, an asymmetric fold that trends across the north-central part of the lava field. The physical features of this monocline were to play an important role in determining the nature of the erosional features of Grand Coulee carved during the great flood. Beginning some time after the flow of lava ended, a cover of windblown silt or loess began to accumulate over much of the lava field, eventually producing the fertile soils of the Palouse country of southeastern Washington. The loess attained its maximum thickness in the Pullman-Colfax area where it is locally as much as 200 feet thick and displays a distinctive rolling surface with steep north-facing slopes. Fig. 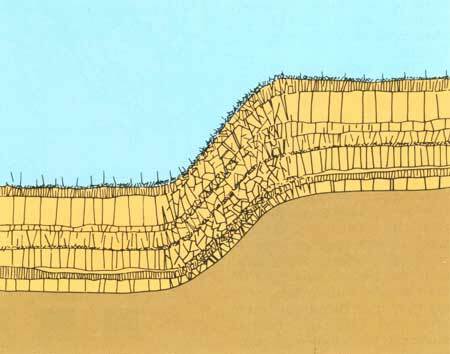 8.Cross-section showing the folded and broken lava flows in the Coulee Monocline. 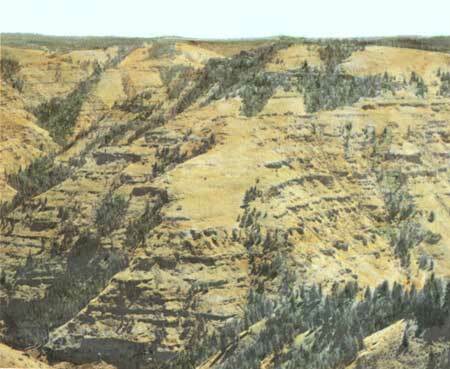 The steep face and broken rocks of the fold had an important bearing on the formation of upper Grand Coulee during the Spokane Flood. 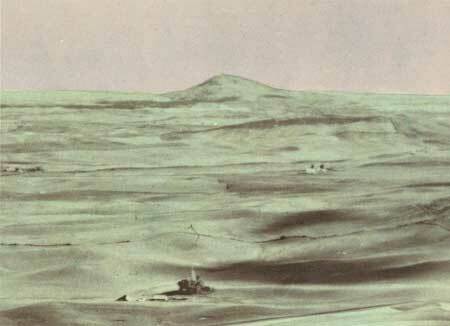 Fig.9.Palouse Hills. Rolling hills of wind-blown silt (loess) in the rich wheat country of eastern Washington. The source of the silt was the western part of the lava field where temporary lakes had formed during the folding. Also incorporated in the Palouse soils is volcanic ash, derived from some of the western volcanoes scattered along the Cascade Mountains of Washington and Oregon. Thus, before the onset of the Great Flood, the geologic setting of the scabland region consisted of a thick, tilted saucer of basalt, in places warped into ridges and completely overlain by a "frosting" of loess. How did the region look? If one were standing atop Steptoe Butte, the view in any direction would be peaceful rolling grassland speckled with roaming herds of antelope, buffalo, and camel with the distant mountains of the Cascades and Rockies forming hazy blue backdrops to the West and East. This tranquil scene was the setting for a catastrophe!